I would not recommend wetting the scab you worked hard to create by drying. 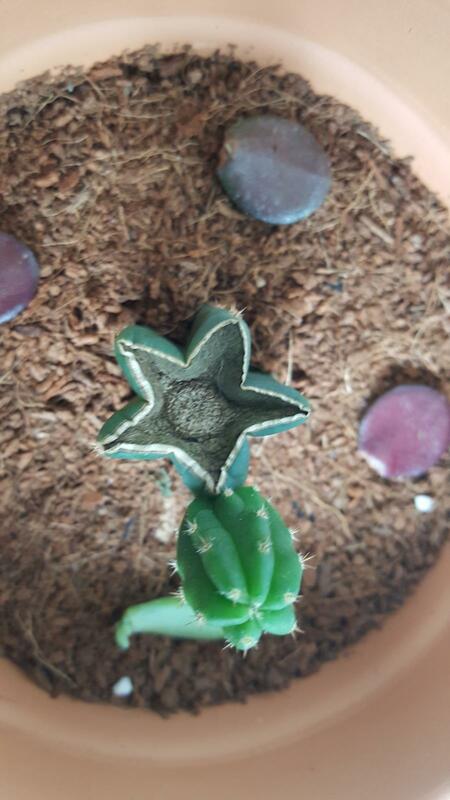 If I use a rooting hormone on cactus, I only use a dry powder sprinkled on the bottom. No wet rooting hormone. Edited by pharmer, 17 June 2018 - 05:00 PM. Got these bad boys from a very generous trade partner. 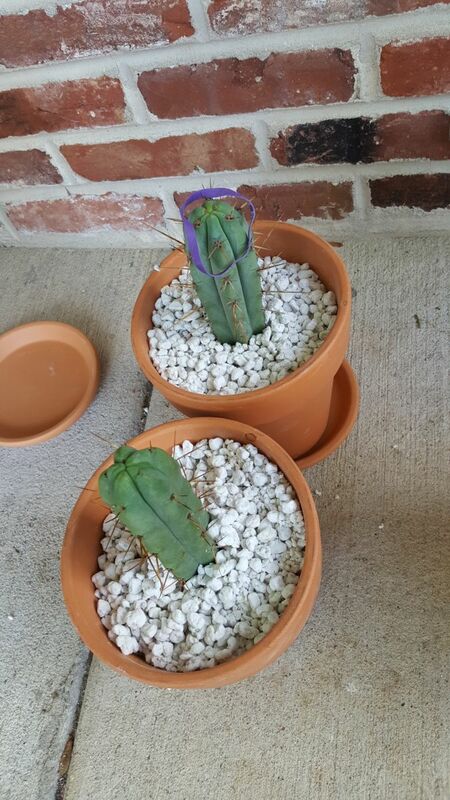 Per instruction they were put into straight perlite, I put clean rocks in the bottom for weight and to aid drainage if they stay in these containers. My instincts are to stay away from soil all together and to stay soil-less whether I use sand or similar. I have every amendment/organic fert known to man in the event it's needed. I'm grabbing succulent leaves like hot cakes too! I'm hooked. yup! they happy so far. The pic of the naked Bridges' in the pic are an unidentified type. I think it came from Jimz several years ago. The one with the rubber band necklace is known as The Baker Clone. When grown in partial shade produces the prettiest frosty blue glaucous you'll ever see. To my knowledge these are not terribly common, probably some kind of FrankenColumn crossbred in somebody's backyard lab. Tthe other has a predictable growth habit. Pups grow very thin and stay thin for a couple years. The plant never puts on much girth until year four or five at which point it gets as fat as any other Trichocereus column you'll see. Nice work Cat! I am so happy you caught the cacti bug!!!! I also have the Baker clone and the naked Bridge. I propogated them this year and am patiently counting the years till I get to see how bright they shine! I have read that some Trich's are even more potent than LWs, however, they do not carry all 50ish alkiloids... I have found I like Sky's method to mix and match when going to the moon. I am currently preparing a Juuls Giant for tea and plan to pick 6 lucky 4 cm LWs to take with me on this journey, planning it for next weekend so I can really refine my tea... I have been lucky so far, I have not thrown up or had any stomach issues when partaking in this magic and the taste doesn't really bother me, especially when consuming with ginger as recommended by Sky... I did skin this Juuls this time and it has made the extraction process so much easier, something to think about if you do the boil and squeeze method for Trichs' extraction. Can't wait to see what else you got up your sleeve, best of luck to you!!! Edited by meyer, 12 July 2018 - 04:47 PM. Just checked the cuttings in coir, mos def some roots are forming. Little tendrils reaching down. 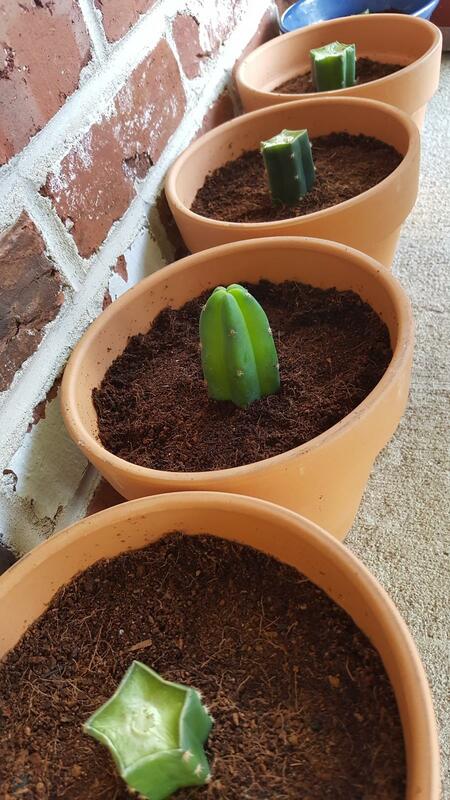 I might water them for the first time, as they are shrinking in size a touch. will let them scab over and root . I'm glad you started this thread too. Might be getting into this side of growing also. 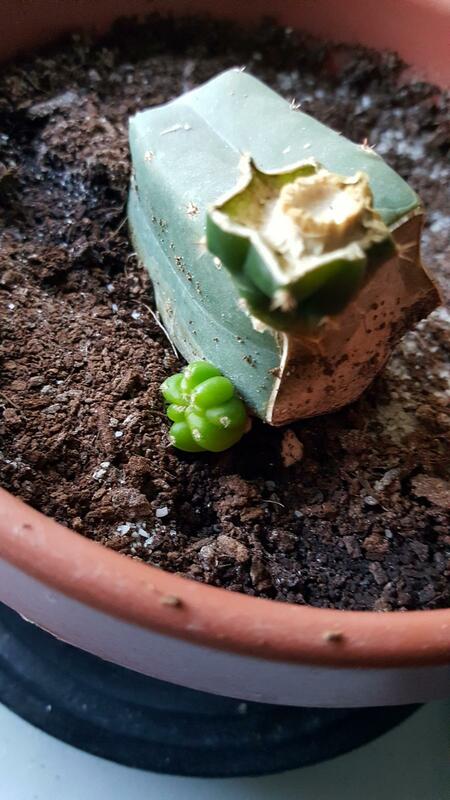 So one of the daddy babies has pupped too! I've only watered these once. 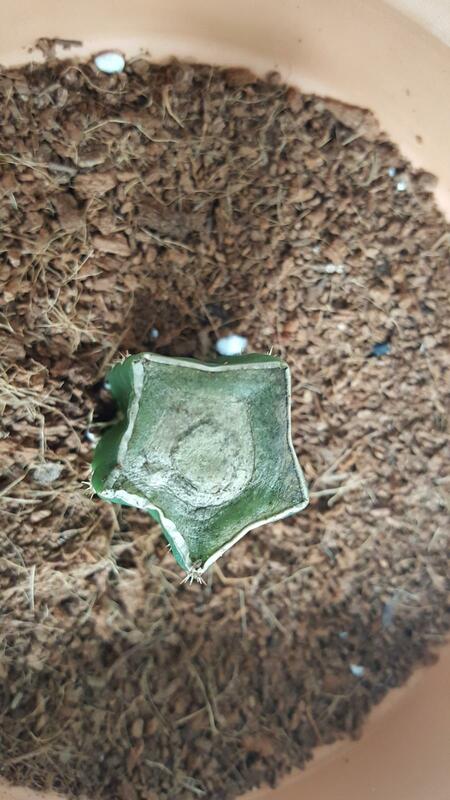 Sooooooooooo, I'm wondering if I should continue to give these guys 'drought' conditions and let the root ball stretch, or if I should start treating this guy like I normally would which is water every time that it dries out, as it obviously 'wants' to grow. What do y'all think? Also, are old seeds from actives viable/valuable? I think that I heard that somewhere. Personally, I would not add much, if any water to that Cat... 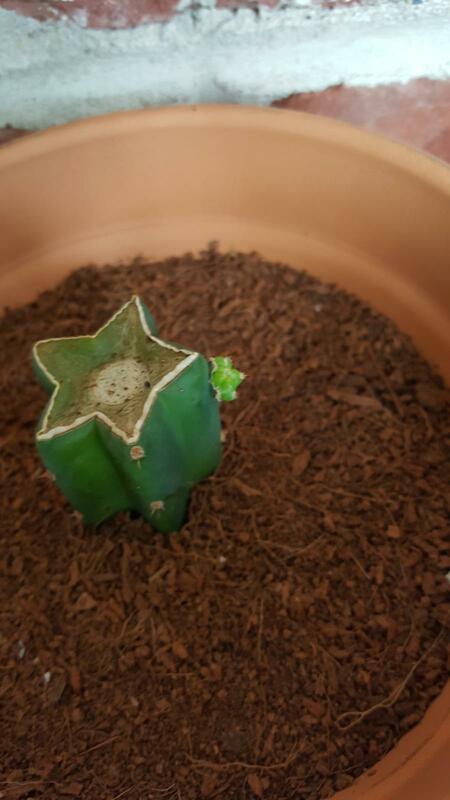 I have let my trich's grow like that not even planted till I actually see some roots and have been very succesful. 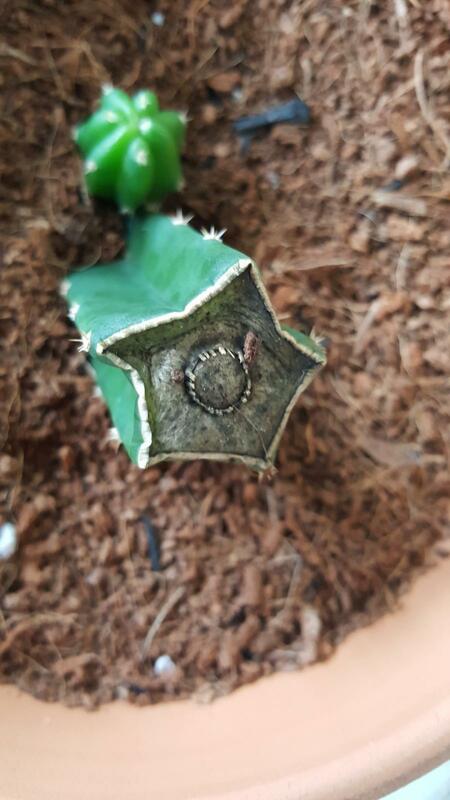 My guess is that the roots you have, are VERY tiny... that lil bud of cacti love can grow several inches without worrying about water, assuming you have 2/3 inches buried. Regardless, I would wait a lil longer or what I would actually do given what I have learned is maybe just wet the feet from a bottom up water, but don't let the whole pot get full of the water... this will make the roots chase the water that they sense from below... Best of luck! Hey guys, should I be concerned about this discoloration? It doesn't rub off when rubbed, I've only watered these maybe twice (once the other day after I noticed the color, as they were noticeably shrinking). They just sit in dry coir outside on a porch (only getting about an hour of direct sunshine a day).